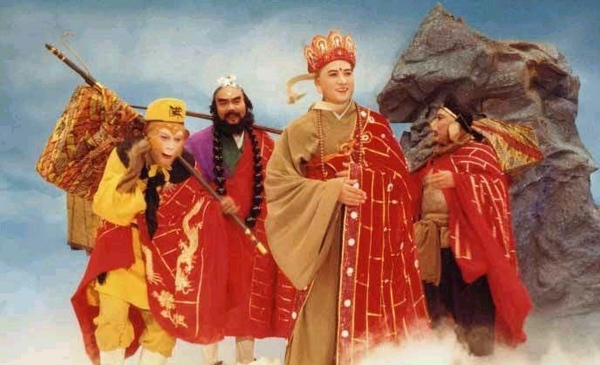 Since Chinese New Year is here, I might as well have a follow-up to my 'A Dream of Red Mansions' post with this humble show called 'Journey to the West' or ' Xi You Ji' 《西游记》, a 25-episode tv drama produced from 1982-1988 in China, directed by Yang Jie and starring Liu Xiao Ling Tong as the Monkey King Sun Wukong. I remembered the 80s was a great time for film & tv-making, whether they were movies or dramas from the Western or Eastern hemisphere, many productions were original, bold and now regarded as classics. The improved (and obsession over) special effects also unleashed a plethora of creative juices from writers and filmmakers. No doubt Xi You Ji is one of the most famous and popular Chinese literature ever written, being listed as one of the four 'Great Classical Novels' (the other 3 being: Romance of 3 Kingdoms, The Water Margin, and A Dream of Red Mansions). Amongst the numerous stage, screen, animation, foreign, book adaptations and satire of Xi You Ji, this one stands out most in people's minds. Ask any Chinese if they have watched this version and you will likely get a yes. It was so big back then, viewership ratings averaged 89.4% when broadcast, and has been aired over 2,000-3,000 times since then. It enjoys high ratings even till today, I am guessing from people who are watching it for the nth time. So besides the nostalgia alert and the Monkey King's kickassery (pun intended), let's see how this decades-old production still emerges superior to the numerous crappy re-adaptations. Published anonymously in 1592 and attributed to Wu Cheng En 《吴承恩》from the Ming Dynasty, this adventure-mythological-Buddhist-Taoist-themed story follows the Monkey King Sun Wukong during the Tang Dynasty and his accompanying Monk Tang Sanzang's travel to India to retrieve Buddhist scriptures. 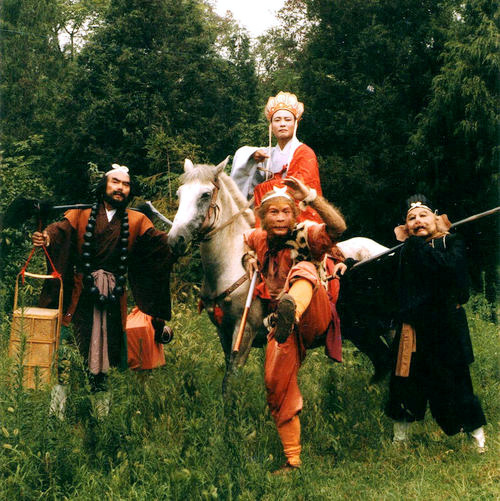 Monk Tang takes in 3 other disciples: pig monster Zhu Bajie, river monster Sha Wujing and a white dragon later transformed into his white horse. 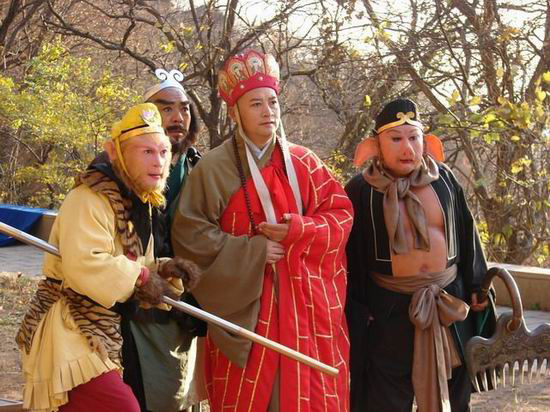 The 5 of them go through many dangers, most of which involve demons wanting to eat Monk Tang to attain immortality. 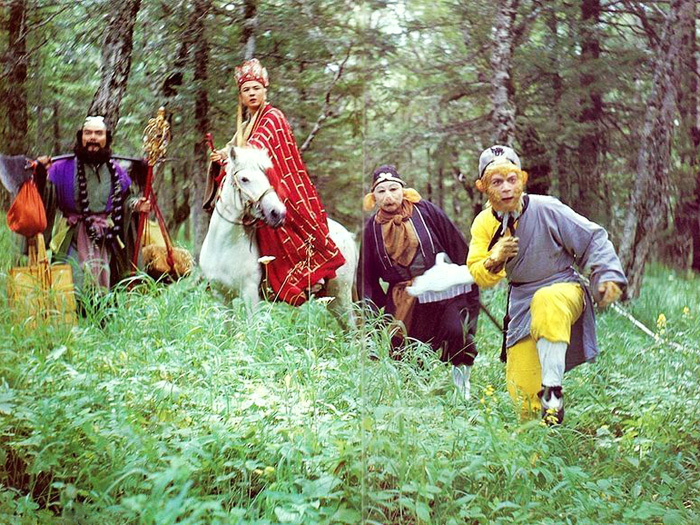 In 1981, CCTV (China Central Television) planned for a big-scale tv adaptation of the 4 Great Chinese Classics. 'A Dream of Red Mansions' and 'Journey to the West' were up first. A Dream of Red Mansions was handed to director Wang Fulin of the tv department (read about my blog post here) and the latter was handed to the Madam Yang Jie of the literature & arts department. She was specialised in opera broadcasts. 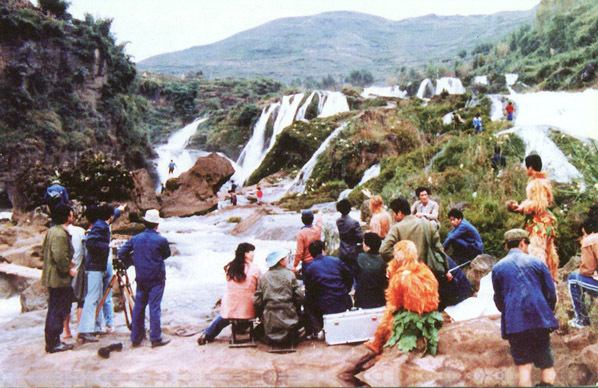 In July 1982, the crew filmed a trial-screening episode of 《除妖乌鸡国》Chuyao Wujiguo or 'Removing demons from Wuji Country', to test audience reactions and for the production team to have a feel for this new method of tv drama production (remember the Cultural Revolution only ended a few years before in 1976). Released in October, reactions were mixed from audiences. However, it was considered a failure for those involved in the show. This story was later re-shot in 1986 and included as episode 13. You can catch glimpses of the earlier 1982 version spliced with 1986-shot footage in there as they reused a few scenes. Since it was an experimental phase, the makeup and clothing were vastly different from the main series, and special effects were kept to a minimum, although the crude animal-like features of Sun Wukong and Zhu Bajie matched closer to the novel's. Performance from the lead, the costumes and make-up were not up to par with the director's vision. After the initial broadcast, the project was budgeted at 3 million yuan for 30 episodes. In 1983, the crew completed episodes《祸起观音院》Huoqi Guanyinyuan,《偷吃人参果》Touchi Renshenguo, and《三打白骨精》Sanda Baigujing. 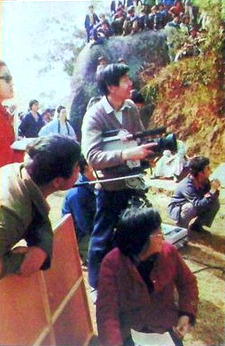 In 1984, they broadcasted《计收猪八戒》Jishou Zhubajie and 《三打白骨精》Sanda Baigujing which proved popular. 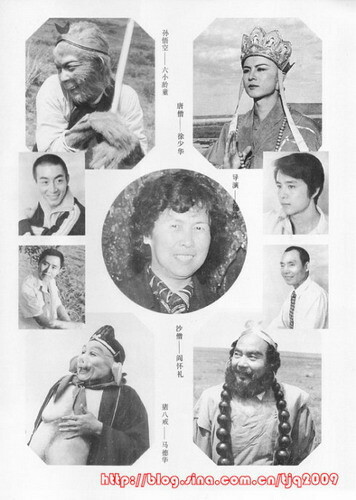 11 episodes were completed by 1985, and the station aired them in proper sequence in 1986 (Lunar New Year). I recall watching a few of these one-off episodes during the public holidays in Singapore when I was little, before the main series. The show had a hiatus while they continued to film the other episodes. In 1986, they finished 9 episodes. While shooting 《大战红孩儿》Dazhan Honghaier, the team ran out of money and CCTV refused to inject any more funds. They were ordered to stop and let it end there despite the overwhelming popularity of the show. Undeterred, director managed to persuade CCTV to let her find financial backers for the remaining episodes. The team scrambled to find corporate entities that could come up with the money but were unsuccessful until assistant supervisor Li Hongchang 李鸿昌 (also the centipede spirit) managed to secure a loan with the China Railway 11th Bureau Group (中铁十一局) for 3 million yuan. In 1987, they completed 5 more episodes and yet again ran out of money as inflation costs had dwindled the budget. Free locations that were scouted before filming were now tourist areas. One thing to note was the crew still maintained the same low wages. Director was forced to scrap 5 episodes from the original 30-episode script, to the current 25 episodes. In total, the crew took 6 years to finish the series from 1982-1988. The scrapped stories are:《险渡通天河》Xiandu Tongtianhe (the one about the tortoise incident mentioned in the last episode),《真假美猴王》Zhenjia Meihouwang,《遇阻狮驼岭》Yuzhu Shituoling,《救难小儿城》Jiunan Xiaoercheng, and《收伏青牛怪》Shoufu Qingniuguai. These stories were later featured in the sequel released in 2000. The drama adaptation does not follow the novel to a T, but the essence is there, and the compelling well-paced storytelling as well as character development. I did not read the book, but my father had mentioned it was darker and bleaker, and the characters were more flawed. The victims do not always get away 'celibate' like how the drama saves them in time. You can call it white-washing if you want. 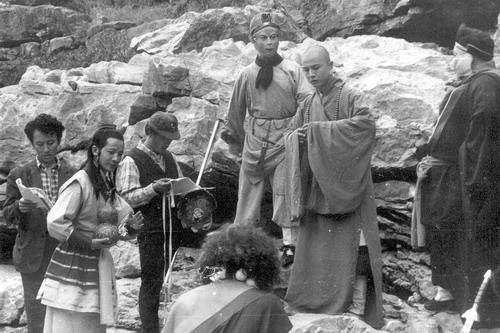 The show emphasises on the adventures and less on the buddhist aspect. I particularly enjoyed the dialogue in chinese - funny, witty and concise. The voice acting is great. Also there is quite a chemistry going on with the actors, I like it when the monkey bullies the pig. Another positive aspect is the soundtrack, and I'm not talking only about the theme song which is some people's karaoke staple. Even the minor tunes enhance the scenes and sound relevant today. Electronica with traditional pipa, zithers, chimes and violins. I don't know how composer Xu Jingqing thought merging those instruments would work but it did. The director was very bold to use him as there were other more prolific composers (he was 8th in line) whom she skipped. You get adventure, comedy, acrobatic stunts, very beautiful scenery, very beautiful ladies, good voice acting, mythological creatures being brought to life, creative use of special effects within a limited budget all rolled in a weekly episode of movie-format eyecandy... for free! The props, graphics and editing appear primitive now but the quality is not lacking in other parts. I also like their liberal use of fog and poufs of smoke! The acting is of course, superb. Liu Xiao Ling Tong is a delight to watch. He's so good like... dammit this Liu Xiao Ling Tong... His Sun Wukong portrayal is compelling, endearing and very expressive, and so synonymous with him their names are interchangeable, he is also a cultural icon. From mischief to rage to hopelessness to child-likeness, they are portrayed through his 'fiery golden eyes' or火眼金睛 Huoyanjinjing. His huoyanjinjing is the life of the show, and due to the good lighting and makeup, they really do shine, even in blurry vhs quality. Actually in episode 2 and 3 before he got his huoyanjinjing, his eyes were already lively. For the earlier filmed episodes like episodes 6 and 9, not so much as they were still trying to improve on it. He is equally funny out of the monkey suit (when disguised in human form) because you can see his full expressions. My dad and I laughed whenever we see him in human form. Thanks to careful details and natural performances, and the director's emphasis on aesthetics, he totally deserved the title of 'Beautiful Monkey King' or Meihouwang《美猴王》because Sun Wukong evolved into something quite photogenic as they improved on the makeup. 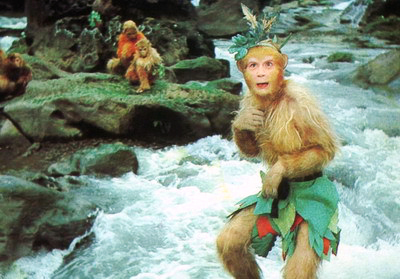 In the earlier filmed episodes he looked more like a brown macaque, but I still enjoyed the performance. The prettiness later on is a bonus. I found it strange that characters in the show would run away when they saw him. Some people don't like him looking this cute as the novel clearly states he is one ugly creature - what they call 毛脸雷公嘴 'hairy-faced thunder-god mouth'. One highlight of the show is obviously the monkey wushu. The main reason for me to watch this back then was the fight scenes... something for everyone! 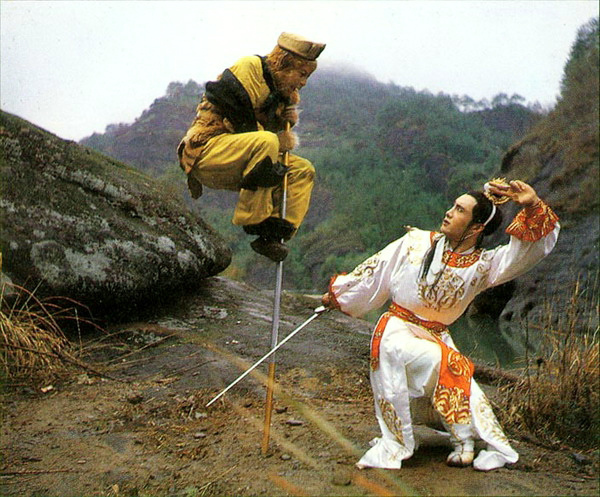 Wukong prefers a cat-and-mouse game being the trickster hero, but the acrobatics when it finally appears does not disappoint; people used to sleek special fx kungfu may find it old-fashioned but I like it this way. He has some impressive jumping skills, precision and streamlined monkey flexibility. I imagine it would be very hard on the body and knees to do all those stunts. If you want to watch how a monkey does elegant, just watch him. Anyhow the first time I saw episode one (1987 or 1988) I wondered, wow is this guy for real? Besides the older filmed single-aired episodes (the Renshengguo one) when he was a brown monkey and not as appealing, suddenly he looked friendly! How can someone behave so much like a monkey, perform his own stunts (did wonder if they used stand-ins), and look that good in fur at the same time? Where did they get this guy from?? And what's up with his name?? And I just knew ALL waterfalls had to have a secret cave behind! I might have clapped. Can't remember. Will get to that later. Ma Dehua is really fun, he has the clumsy movements down pat, when he fights he's pretty agile for a pig lol. I get a kick out of watching him battle. Actually his personality is kind of lovable and not annoying. As mentioned earlier, he has chemistry with the monkey and the writers improved his personality, rather than indulging in smear campaigns against Wukong all the time. He is also very expressive despite that huge mask. It's no wonder he is used in so many roles. 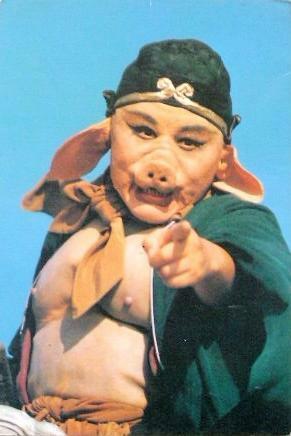 When I was young, my favourite character was Sha Wujing. Just straightforward hardworking and loyal, playing mediator and not as stupid as Pigsy. 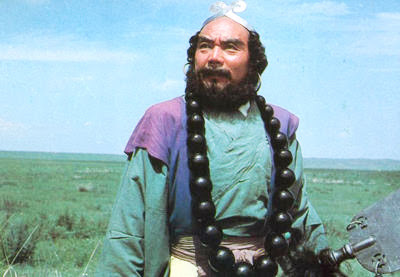 And since there were 3 Monk Tangs, I think I would pick Xu Shaohua as the best monk due to his looks. I'm NOT counting the sequel! His fair, fragile appearance (what you call 白白嫩嫩) would tempt those monsters to eat or flirt with him. The permanent supporting cast - actors that were part of the crew, as well as invited established stars were memorable. They were definitely into their roles. Just check out the mass monkey troop fighting scenes where even the background extras were doing their best, not obviously faking it. And then check out the sequel lol. And the city street scenes where the extras were hawking their wares, it looked authentic! I also like the costume design; the fairies, villains or humans are all quite pleasant to look at, especially Wukong's outfits. He is such a vainpot. Although a few may be a tad fancy for a monk, such as that red short-sleeved one with leopard fur frills, they do look nice. 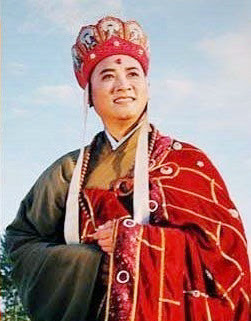 The Dasheng outfit is also elaborate and grand, matches his arrogance and flamboyance. I wonder if that's the reason why Wujing has to carry so much baggage - all of Wukong's fancy dresses and hats! Comparing to the 1982 trial episode with that horrendous Tarzan-looking dowdy t-shirt combo (peach pink?? ), they have come a long way. The director incorporated her opera experience and elegance of the performing arts foundation from her talents into something sublime, fits just right for an old mythological literature like Journey to the West. I don't buy modern day slang and behaviour seeping into period drama! As for flaws, sometimes the endings are a little abrupt due to a lack of time, although the episodes are longer than modern day's dramas - the version I watched was over 50 mins to over an hour long, current rebroadcasts are cut to fit under 45mins. Also the paper-like graphics (eg. White Bone Spirit episode) and human-in-costume props are laughable, but most of these were the only choices they had. The bad graphics were due to missing software needed to turn the 2-D effects into 3-D. Apparently the tv station did not want to spend on this software... money problems keep plaguing the project. Can you blame them for all those red tape they had no control over? I believe the director was unhappy with the outcome but it had to be presented, flawed or not. I was a little bugged by how the white horse was practically useless except for maybe 3 instances. Animal is a bit reluctant sometimes like it didn't want to be there lol. I was actually worried for the poor thing because of the terrain it had to travel on, and they used one in the scorching hot desert too. But it's real enough. And the golden bands on their heads, they kept swapping materials and looked particularly jarring when the bands were made of foil. Of course, the best kinds were the metal ones. However any of those (even the foil ones) in this version are better than the ones in the sequel since it is still a band + hat over band (overlaps and realistic). The sequel was when they got real lazy and just glued a gold band onto the hat and the chin strap sticks under the band, which doesn't make any sense. Wukong can't remove the band so he can't have a hat strap under it. Oh well. 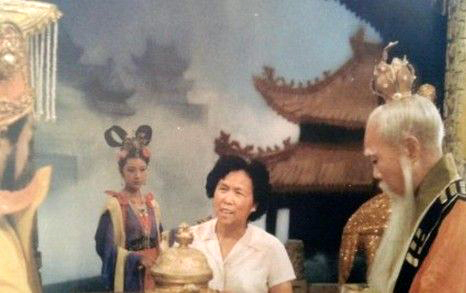 - Xi You Ji was China's first large-scale tv drama made, along with Dream of Red Mansions. One reason for the project to commence was because Japan had already made their own version, and China had not. The station tasked the director... just make it better than Japan's! - Director Mdm Yang Jie is a warrior woman. There were opposing views on how she should film the series but she stuck to her guns. Everything had to look pleasing, even the villains, and the genuine atmosphere of the arduous travel. She became the producer after conflicts with her producing supervisor, who did not understand what she was doing and felt she should cut costs and work faster. Actually the team was working non-stop at a hectic pace. 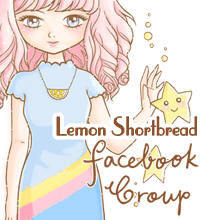 She was involved in budgeting, finances, scouting, scripts, editing, casting, etc. - Throughout the series, they only used ONE camera. Cinematographer Wang Zhongqiu and the director are spouses. It broke down often and footage was not as clear as newer cameras; it was old with separate recording equipment and had to be manually carried. They could not do concurrent scenes so they were shot individually, which is the main reason why it took 6 years and some cuts appear choppy. It did not come with zoom lenses, they had to submit an application to CCTV every time they needed it, and it was limited to 3 days at a time. 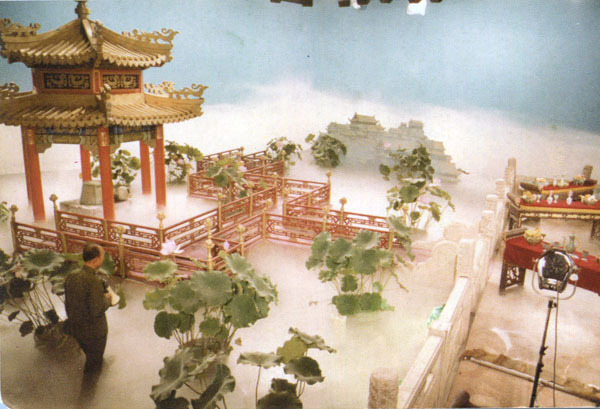 Special effects were done in the tv station in Beijing so they had to make sure they had all necessary footage required before returning as pick-ups were not convenient to do. - Because of a lack of modern equipment, the cinematographer had to get himself in the most awkward positions to get the perfect shot. It was primitive, makeshift and almost pathetic but kudos to him for the results. You'll see him dangling over a plank or suspended over a ladder or lying on the ground with the actors jumping over him. In one scene that wasn't used, they were planning an aerial view taken from a plane, so Mr. Wang had his assistants hold his legs while he filmed outside the plane door. 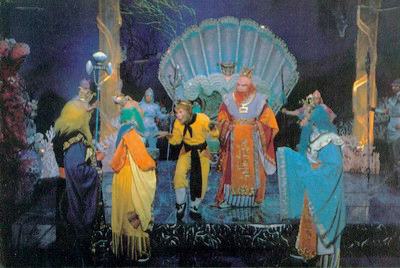 - Actors and actresses were scouted from opera, stage, film and dance performance troupes, some were established actors, most were stage/opera performers, some were students. Back then, they had to get approval from individual troupes to borrow their talents. - Two people voiced Sun Wukong: Li Shi Hong 李世宏 (ep 1-5) and Li Yang 李杨. - The team traveled 19 provinces all over China and then Thailand to film the perfect scenery. The initial scout by the director was 26 places I think. They were accused of misusing funds by using the location shoots as excuses for vacations. CCTV installed 3 personnel to monitor the crew, who promptly changed their minds as the team was relentlessly shooting in undesirable conditions, and the personnel suffered along with them. They agreed to request for more funds and a new camera from the station, but the new camera came about only during the year-end of 1987 when they were almost done with filming. - Some locations were especially hard to get to, dangerous to film in, or did not have modern amenities. Logistics-wise this was not efficient or comfortable, but the director wanted the show to be presented as authentic as possible, rather than relying on studio sets. 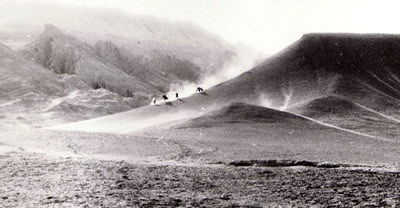 The team sometimes camped outdoors and lodged in poor conditions as these places were undeveloped. It was said one place was infested with rats and they had to take turns beating the rats as they were running over them while they were sleeping. - The highest paid was director Yang Jie, Liu Xiao Ling Tong and Ma Dehua; their wages were about 70 yuan (about US$11.20) per episode. Each episode would take 3-4 months to complete. - The production spent the majority of the budget on art and operations, and probably the least on wages. 30 cents were allocated for dinner. Some local officials offered free meals and lodging. 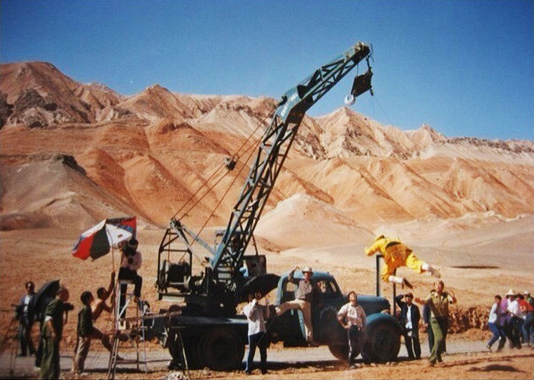 - The main cast, supporting cast, and production crew were treated as equals. All had to help carry equipment to locations and pack them up after the shoot. If they needed extras, the production crew stepped in! Cast performed multiple roles (very fun to spot them out). 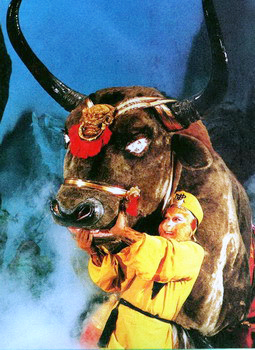 The most number of roles went to Ma Dehua (Bajie) and Xiang Han 项汉 (Black Bear Spirit/Gao Cai). 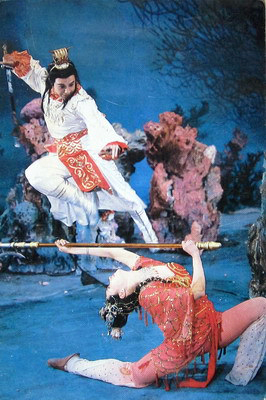 Lin Zhiqian 林志谦(Erlang Shen 二郎神) and Xiang Han also choreographed fight scenes. - There were low safety standards and no insurance. 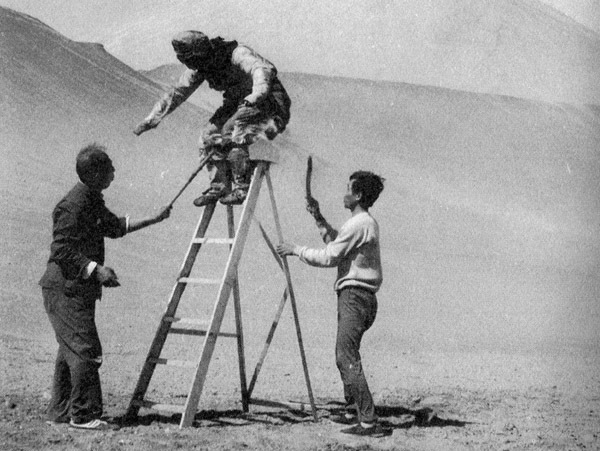 The wires used for flying scenes were thin metal wires and broke often, hurting whoever was flying. Also their technique was not safe as it consisted of one loop suspending the harness around the waist or hip. 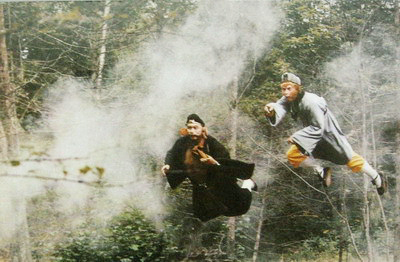 Prior to this, they had no experience of wirework, so director and cinematographer went to Hong Kong to observe how wuxia drama did flying scenes and figured it out themselves. - The crew used cardboard cartons when there were not enough cushions for jumping or flying scenes. If both were not enough, they spaced it out so one might end up on the hard ground anyway. - Being action intensive and with low safety assurance, injuries and dangerous incidents were common. 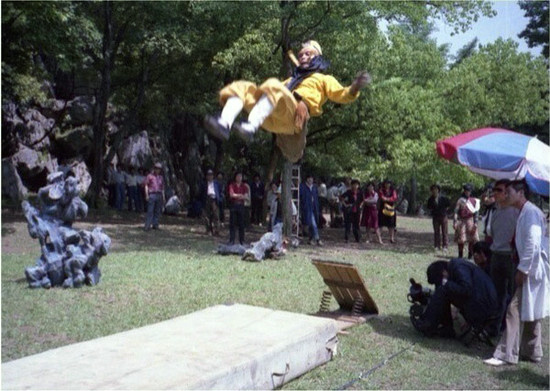 One more serious accident occurred when Liu Xiao Ling Tong fell several meters after the wire in the pulley wheel dislodged during a flying scene. 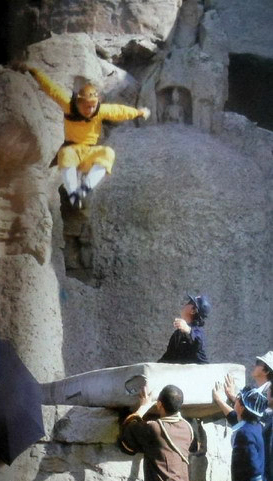 Xiang Han (then playing the monkey general) saved his life by diverting his body before he hit the ground. Although knocked unconscious from the impact, he survived a potentially fatal disaster with just broken bones. Another incident was when he slipped over a cliff and tumbled into a ravine and stopped because his foot caught a vine, he also almost went over a waterfall when he lost his footing in a slippery icy river fight scene. 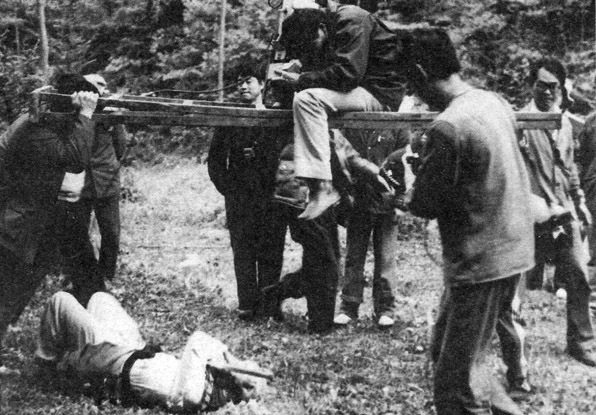 Yan Huaili (Sha Wujing) once crashed into cinematographer Wang Chong Qiu after his wire broke, knocking out poor Mr Wang. - To make the burning scenes more realistic, they set real fire onto Liu Xiao Ling Tong and Ma Dehua in Dazhan Honghaier and to the former in Sanjie Bajiaoshan. Side effects included fizzled eyelashes, suffocation and melted prosthetics. - The prosthetics were painful to put on and the material was not breathable. The glue stung when in contact with the skin, combined with perspiration from physical exertion, it would slip off and had to be reapplied. Using alcohol to remove the glue and peeling off the mask was like a harsh chemical exfoliation every time. 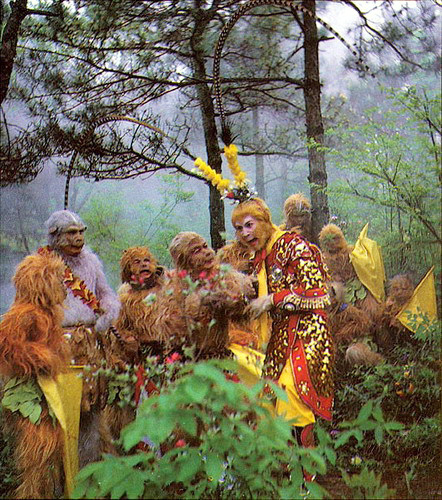 Wukong and Bajie dreaded it so much they would make the other party do their makeup first. They were not able to eat normally with the masks on and would rather finish all their scenes first before meals, than go through the pain of removing and reapplying the mask. - Sharp-eyed Wukong has myopia, he is about 600 degrees (!) near-sighted with a 200-degree astigmatism. Initially it was kept a secret because the director would have chosen someone else. When he kept hitting his opponents unintentionally during fight scenes, the director wanted a stand-in thinking it was due to his faulty technical skills. But he was fine when performing solo, only then he admitted he couldn't see very well. His fellow actors learned to duck very quickly. - To exercise the piercing appearance of his eyes, he stared at sunrises and sunsets, lighted incense sticks and moving ping pong balls. Good lighting and improved make-up also helped the effect immensely. Thus was born his signature 'fiery golden eyes' or 'Huoyanjinjing'《火眼金睛》, a vast improvement from the 1982 trial episode when his eyes appeared blank and not in focus. By the sequel in 1998, his eyesight was fixed through lasik. - Liu Xiao Ling Tong was allowed to keep a pet macaque for 6 years on set, which inspired and taught him to imitate a monkey as close as possible. Before that he grew up with monkeys at home. Tang Juquan 唐继全 is the photographer for the series and has a blog. 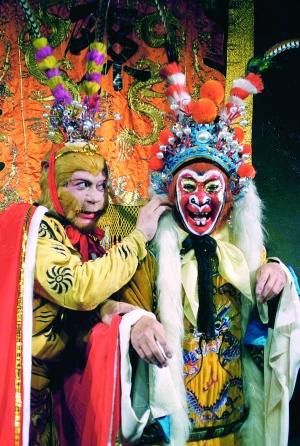 - Liu Xiao Ling Tong 六小龄童 (real name Zhang Jinlai 章金莱) is a 4th generation monkey king opera performer. 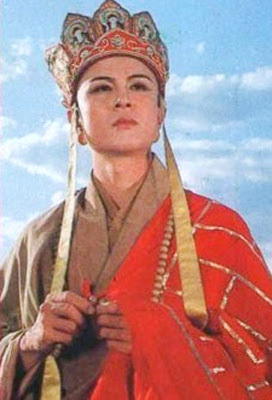 His father Liu Ling Tong 《六龄童》(real name Zhang Zongyi 章宗义) was the renowned Southern Monkey King《南猴王》based in Zhejiang Shaoxing Opera. His stage name means six-year-old child because he started learning the art at 6. He added a xiao (little or junior) word to his sons' stage names. 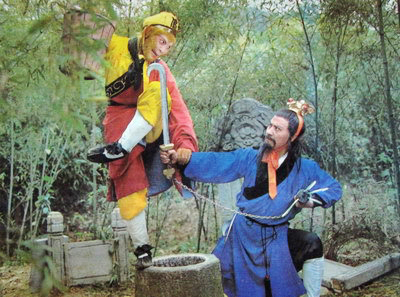 Liu Xiao Ling Tong's elder brother, Xiao Liu Ling Tong 小六龄童 had the natural flair for performing monkey since he was 3, and was set to continue his father's legacy. Sadly he passed away aged 16 from leukemia. Liu Xiao Ling Tong was not interested in performing and introverted, preferring to read books. He took over the reins after his brother entrusted the role of Sun Wukong to him (then aged 7) before the former passed away. - He studied under his father's teacher from the Shanghai Theatre Academy, Mr. Xue Dechun 薛德春. As Liu Ling Tong was blacklisted during the cultural revolution, and it was illegal to teach a family member of a blacklisted artist, Liu Xiao Ling Tong trained under cover of darkness in secret before school. 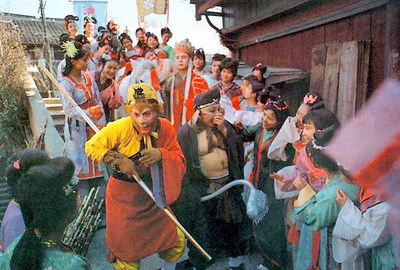 He enrolled as a student under the Zhejiang Kun Opera troupe as a wusheng 武生 (combat acrobatic actor) in 1978. 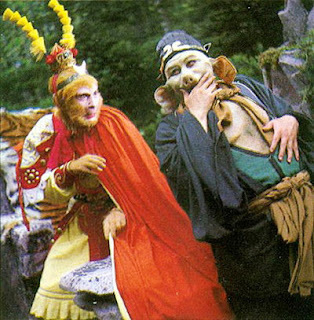 In 1981, just as his troupe was preparing to produce a series of Monkey King Kun Opera after a successful run of "Sun Wukong Sanjie Bajiaoshan" 《孙悟空三借芭蕉扇》, his father received a call from Mdm Yang Jie looking to cast Sun Wukong. 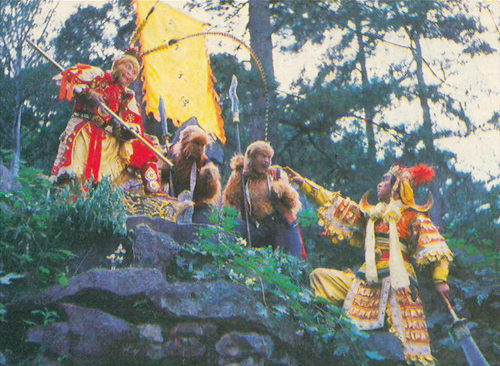 - She initially sought out the Northern Monkey King 《北猴王》 but had disagreements about featuring painted faces on the show. 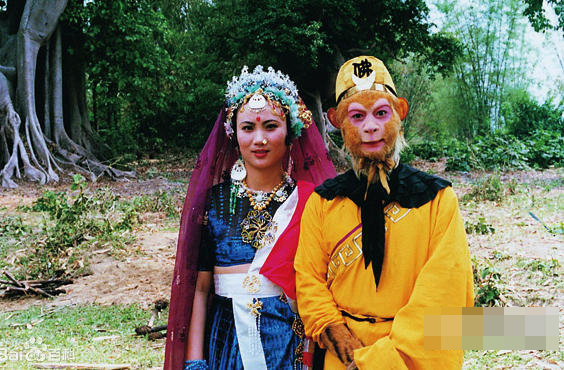 After a futile search, she recalled the Southern Monkey King whom she had a deep impression with his opera movie 《孙悟空三打白骨精》"Sun Wukong Sanda Baigujing". They met up at Shaoxing after he said she can pick out someone from his school. Asking for Xiao Liu Ling Tong after seeing his photo on the wall, Liu Ling Tong told her he had passed away in 1966. He then insisted she must try out his youngest son (then aged 23). Her first impression was that this Zhang Jinlai appeared too quiet and bookish, and didn't fit the personality of exuberant Sun Wukong. Liu Ling Tong was adamant his son was the perfect candidate and would train him up. She was too polite to reject his offer. 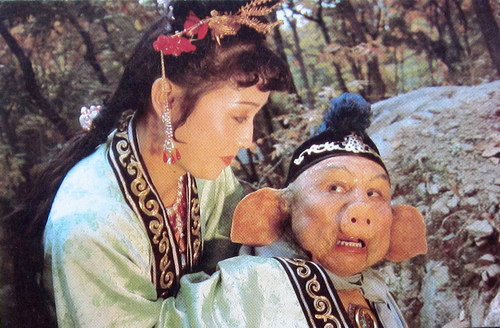 He also recommended his nephew, Qi Xiao Ling Tong 七小龄童 as Zhu Bajie. They went to Beijing together several weeks later to audition in front of a panel of decision makers and Liu Xiao Ling Tong received the role. - His 'failed' performance in the 1982 test screening was his biggest setback as shyness resulted in a stiff performance. He spent a week mulling in solitude and asked to be replaced if necessary, but his father and the directors sent encouragement with doses of pep talks, and he finally stepped up to the challenge and set his reservations aside. - The director ordered him to learn independence as he had limited life skills. His father made three rules for him to observe: 1. Do not miss home. 2. Work in harmony. 3. No romance. He broke the 3rd one by falling in love with crew member Yu Hong 于虹. She also appears in the series as an Indian queen. Their romance was kept secret for 6 years because it was banned, so the director and crew never knew, although Ma Dehua did. They married in 1988 on the night Liu Xiao Ling Tong received Best Actor at the Golden Eagle Awards. - For the role of Zhu Bajie, the director decided to look at actors doing 'chou jue' 丑角 or 'clown role' in opera and found Ma Dehua (aged 37) from the Beijing Kun Opera troupe. He had to put on weight for the role. 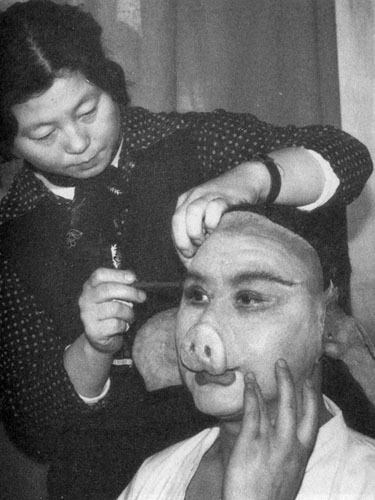 Initially he had reservations over playing a pig, as he is surprisingly, a muslim Hui minority. He plays the most number of roles in the series and you can spot him in every episode, just look out for his trademark dimples. He even played one of the monkeys. - Yan Huaili (aged 46), a drama actor, was discovered by production assistant/actor Li Chengru 李成儒. He saw Yan Huaili at the Beijing People's Art Theatre practising on the parallel bars. 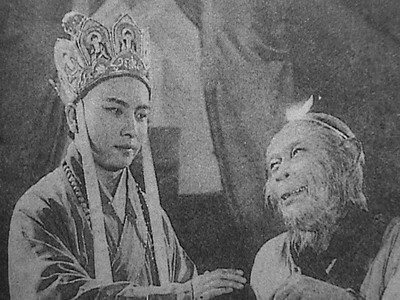 Li Chengru dragged him to a screentest thinking he would be suitable for something in Journey to the West, but he wasn't fierce-looking enough to be a monster. Director heard him speak as he wanted to leave and thought his voice was exactly as she imagined for Monk Sha Wujing. He dubbed his character in the show. He passed away on 12 April 2009 (also Liu Xiao Ling Tong's birthday) from lung infection complications, due to declining health from pulmonary fibrosis caused by accidental exposure to toxic insecticide. - The first Monk Tang, Wang Yue (aged 27), was selected by the director when she saw his yearbook photo at the Beijing Film Academy. He was the 2nd member of the cast to be confirmed. To understand and get a feel for his role, he shaved his head and stayed in a monastery. He also redesigned and painted the images on Monk Tang's hat. He left after 4 episodes to pursue film commitments at the advice of his teachers. - The 2nd Monk Tang, Xu Shaohua (aged 24), was spotted by the director in a movie and auditioned for the role of the white dragon. 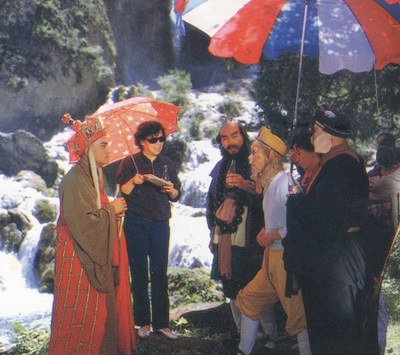 Wang Yue had just left and the director thought he was more suitable as Monk Tang, though he needed to gain weight. He left the series to pursue a university degree despite being requested by everyone to stay. He stayed on the team for about 2.5 years and is probably the most popular Monk Tang because of his looks. - After Xu Shaohua announced his departure, the director stressed over his replacement. Along a dark staircase at the tv station, she walked past radio actor Chi Chongrui (aged 30), as he was collecting his salary. She yelled for him to stop. Caught by surprise at her sudden outburst, he thought she had mistaken him for a burglar. He agreed promptly when asked if he would take the role. His first appearance was the well dragon, this was a test of his endurance level because the prosthetic was very uncomfortable. In 1998, director and part of the cast & crew reunited for an additional 16 episodes, intending to complete the 5 missing stories. 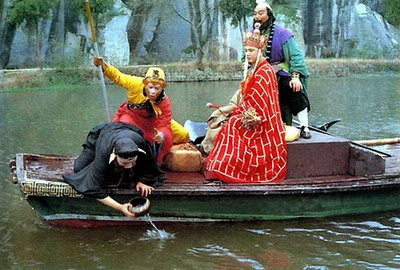 It is simply called 《西游记续集》Journey to the West sequel, released in 2000. Technically it was not a sequel but a continuation, as the original show was never considered complete by the director. She pushed for these episodes to be produced for many years with no success due to a lack of financial backers and permission from the TV station. That was a pity as they had lost quite a bit of flavour, many of the original crew and youthful energy over the 10-year wait. The screenplay was rewritten to include whatever else they could find in the novel to pad the show into 16 episodes. This affected its quality, because the pacing was slower and repetitive. And it lacked a quality soundtrack that played an important part in the success of the first series. Welp, it's going to be a chunk of negative review so you can skip if you don't want to read my complaints lol. 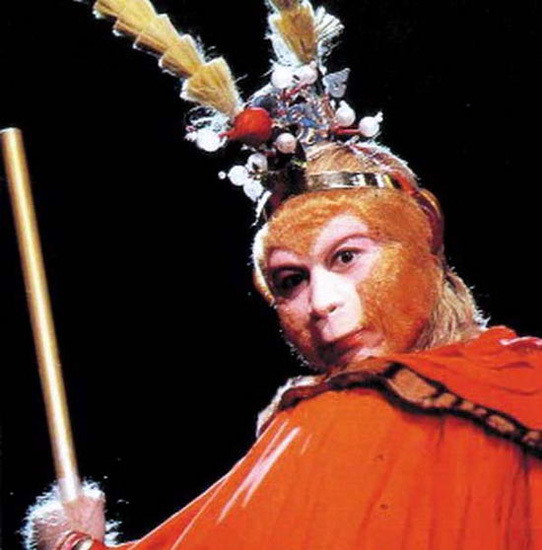 First, I thought the makeup on Wukong was not natural (colour, fur, mask) and the choreography & wushu not monkey-ish enough. 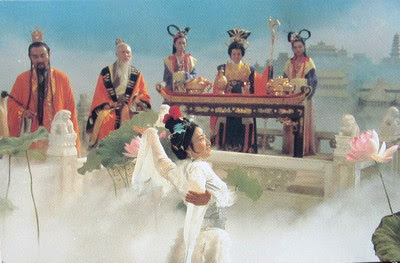 Granted Mdm Yang Jie did not direct the wushu scenes to save time, so they got Hong Kong martial arts director Cao Rong 曹荣 to choreograph and shoot, it was sleek but typical Hong Kong wuxia-style. If I wanted to watch that, I'd watch a wuxia drama. What happened to Wukong's smashy-smashy? Meaning: Wukong leaps into demon's cave from somewhere high up, teases the demon and starts wrecking the furniture, smoke and sparks fly around, he twirls on his cudgel, disappears and reappears behind the villain and a swift kick to his buttocks!! And you laugh along with Wukong. Instead in the sequel, you get Wukong and demon outside in an open field - convenient - and they start spinning in the air, do synchronised twirls and the you-attack-I-defend confrontation. Wukong's jingubang can be replaced with any old stick then. 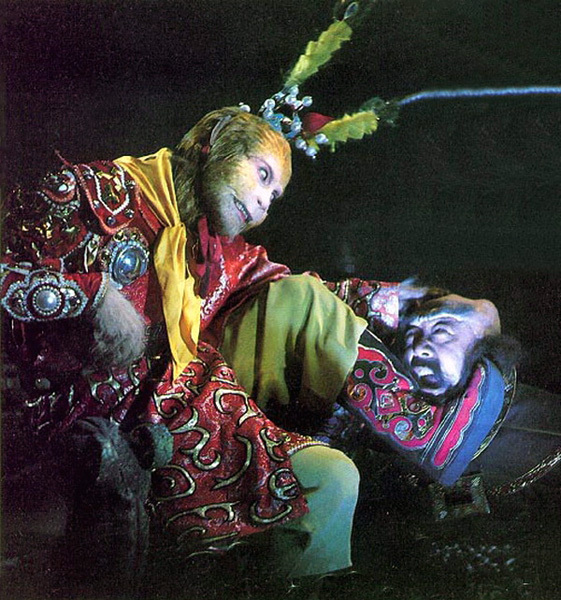 I missed the overhead monkey somersaults and monkey leaps, missed the way they utilised elements of opera in Wukong's body movements, missed the golden eyelids that shimmered each time he blinked. Maybe it was the lighting? Maybe it is missing the original crew's direction? I don't know. And most importantly I missed the mischievous glint in the eyes, I think it was the mask being larger & thicker than previously; so that hindered whatever limited natural expression he had left like smiling and the eyebags. 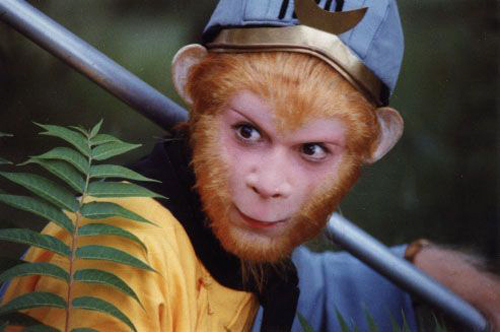 Here Wukong is like a masked monkey. There was a glimmer of hope in ep. 13 with some interesting moments (the wushu was choreographed by original Lin Zhiqian 林志谦, the smashy-smashy is back, except they fast forwarded his signature pose) but not enough to save the series. Pigsy here did not show any cute aspects and some parts of his character did not match up with the somewhat endearing pig in the original series - yes, he complains and is greedy but it was too much here, how could they have written him as going off to sell the horse when his master was clearly not dead yet? The horse is not even a real horse, it's the dragon prince! Who needs enemies with brothers like these? There was very little natural comedy, I didn't laugh once except in episode 13 when Monk Tang spat out the hearts. A plus point is probably the cameo of Li Hong Chang in ep. 13 (the centipede spirit from the 80s version). Don't know why but I like this guy for some reason. A few episodes are interesting, some are repetitive and many scenes are slow on pace. I definitely prefer a one-story per episode format but understand why they had to drag it out. The makeup for some of the villains like the elephant, leopard, lion are nicely done so it's not all bad, but the lipstick colours (mostly in brown tones) are very late-90s and outdated, ditto for some costumes and hair, so very 90s and modern synthetic fabrics. The 80s series costume and makeup still stand up better to time. Anyway, I'd recommend a watch if you want to complete the story but not a must. It isn't that bad of a tv series but compared to the 1980s version, it pales in comparison. I watched it because Liu Xiao Ling Tong was in it. 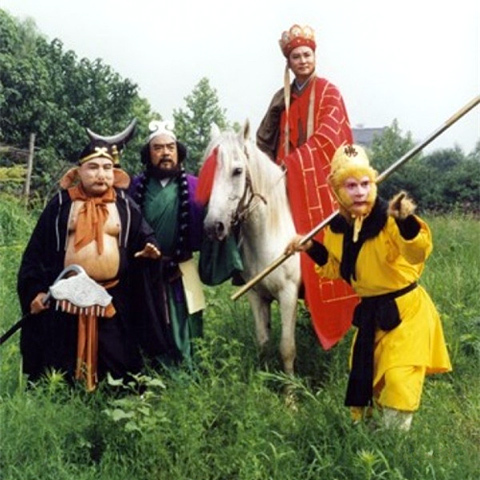 If you'd like more of the original cast, there is《吴承恩与西游记》"Wu Cheng En and Journey to the West" from 2010. This almost-schizophrenic drama tells of how the author completed his novel amidst a villain out to foil his book and kill him. 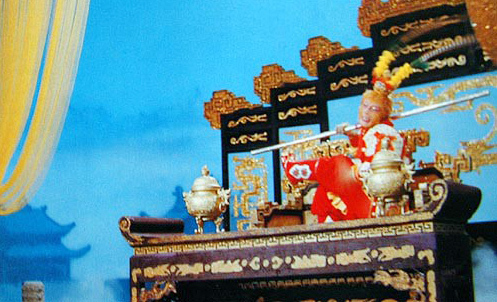 You need 3D glasses to watch this because all the Monkey King segments are in 3D. They included segments from the 1980s version and the 2000 sequel, with a few new sequences but nothing you didn't already know, just a very brief outline. 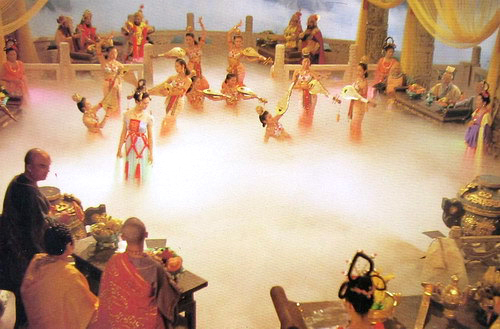 It is mostly about Wu Cheng En (played by Liu Xiao Ling Tong) and his 2 wives. Ma Dehua is back as Pigsy which was nice. I like one of the brown pretty variation of the monkey, unfortunately this one doesn't turn up often, instead they seem to feature the ugly brown monkey more, which symbolised the early stages of the character development I think. 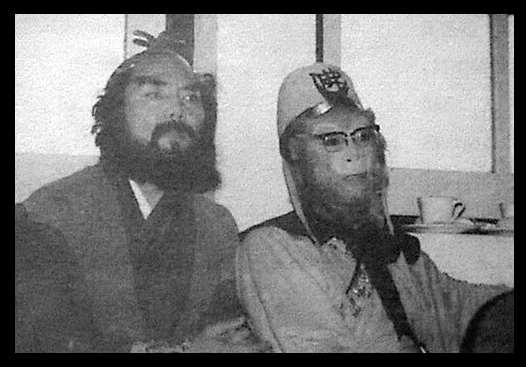 Sun Wukong doesn't look like a 50-year-old, the golden monkey mask looks good from afar but can't tell exactly because all I see are double images (don't got my 3D glasses). Wukong looks a bit chubby with all that layers of clothing. I believe Li Yang did the voice dubbing for monkey again? Unfortunately his voice has deteriorated so Wukong sounds like he has a sore throat lol. Watch if you are curious but again, not a must. The plot is (I'm pretty sure) mostly fiction although based on a historical person. What a long post, I'll just end here. 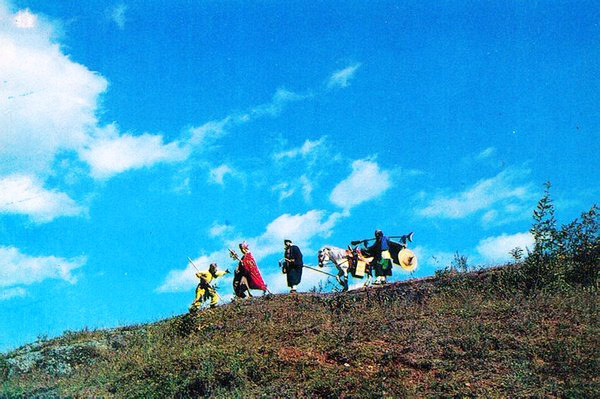 May do a part II if I'm up for typing, I got to revisit my Water Margin and Romance of Three Kingdom dvds! 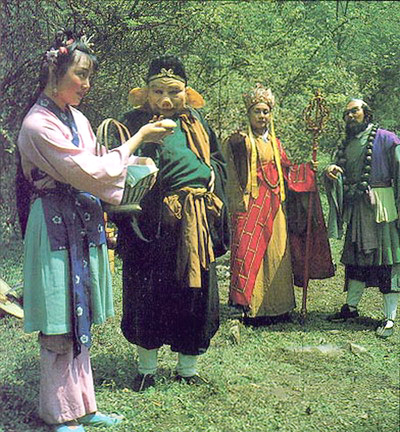 Liu Xiao Ling Tong's solo segment from 1987 Xi You Ji New Year special called 'Qi Tian Le'《齐天乐》. Qi Tian Le in its entirety can be found on Youtube. It involved the cast and crew and was made to update audiences while they were filming the rest of the episodes later released in 1988. This year is the Goat or Sheep Year, I think monkey is next year. We will see if that Xi You Ji movie they were talking about with Hollywood will come to fruition in 2016. But anyhow I am going to enjoy my bbq pork slices and pineapple tarts lol. Here's wishing all a blessed Lunar New Year! This is the best and most interesting and informative review of the beloved classic tv show of my childhood. Thank you! When I watched it I truly believed Sun Wukong was real.xD I've watched some other versions and adaptions, but nothing comes close to this adaption and Liu Xiao Ling Tong is THE monkey king who will never be dethroned. Wow... this is a surprise to me, to find an in-depth review and story about this classic drama firm. I like it very much. I found this drama firm by Mdm Yang Jie in a box of VCR tapes when I was 6, recorded by my late grandpa as loves opera and Liu Ling Tong's work. I heard that he recorded this series as a memory because it stared by Liu Ling Tong's son Liu Xiao Ling Tong. I watch it many times until I was 16 and the tapes were deteriorating and searched for a digital copy ever since very last working tape deteriorated a year later but couldn't find one. 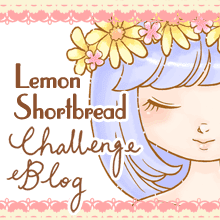 I had no idea there were so much work and some much danger involved while firming this series until now. Thank you very much for this. I'm gonna resume the search again for a better copy this drama series and keep it as part of my late grandpa's memoir.